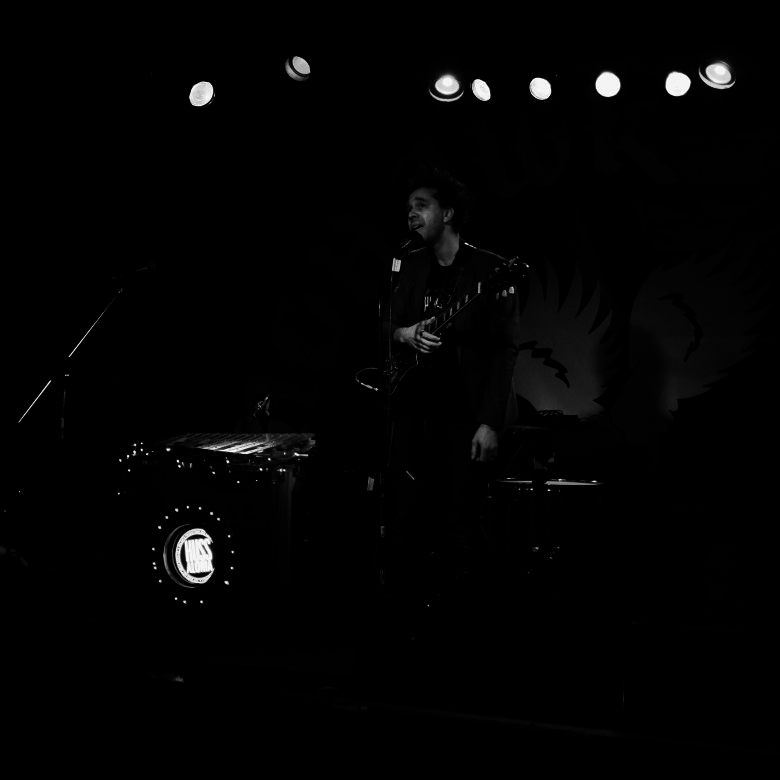 The Hussalonia Founder pictured in a recent gig at Buffalo's Mohawk Place. Note "The Mystery Box," a handmade creation that houses looping electronics and a glockenspiel. Photo by Jonathan Hughes. For the last twenty years, a mysterious Buffalonian has been writing, recording, and releasing eclectic, conceptual art-rock in abject obscurity. He calls it Hussalonia — a "pop music cult" — and he refers to himself only as The Hussalonia Founder. Oh, and he also claims to be owned by Nefarico™, a fictitious soap company. If this all seems unreal or plain absurd, you can investigate for yourself _ Hussalonia offers its entire catalog of over 450 tracks for free on its Bandcamp page. He's calling it his "New Listener Outreach Program," hoping to gain new listeners before releasing new music in 2018. Where to begin, you ask? There's Pop Does Not Mean Popular, a compilation that serves as a primer for new listeners, omitting Hussalonia's more experimental work. Last year, he released Beware, Young Lovers, a quirky lo-fi album of whimsical love songs, and Dogdammit!, a polished power-pop album that was recorded while The Hussalonia Founder had laryngitis. Home Taping Is Killing Me highlights Hussalonia's songwriting skills through the lens of roughly-hewn, lo-fi punk pop. And Double Fantasy is a mature pop record, a conversation with John Lennon's album of the same name. But then there's experimental albums like Nefarico™ Soap Operas, a series of skits that emulate radio plays, all thinly-vieled advertisements for Nefarico™ soap. And there's The Somewhat Surprising Return of the Hussalonia Robot Singers, which features robot vocalists singining about robot concerns. There's an album of re-imagined Scott Joplin rags (Know Your Joplin Rags), Eastern European Anthems (Know Your Eastern European Anthems), noisey funk rock (My Dead Tooth), faux-heavy metal (Satan Under the Sofa Cushions), soap jingles (The Somewhat Surprising Return of Nefarico™ Jingles), and sound collage (OMG LOL WTF), to name a few more. It can be overwhelming and alientating, but that's sort of the point. Hussalonia is an art project, meant to appeal to lovers of the esoteric, people who like mystery in their art and enjoy the process of discovery. 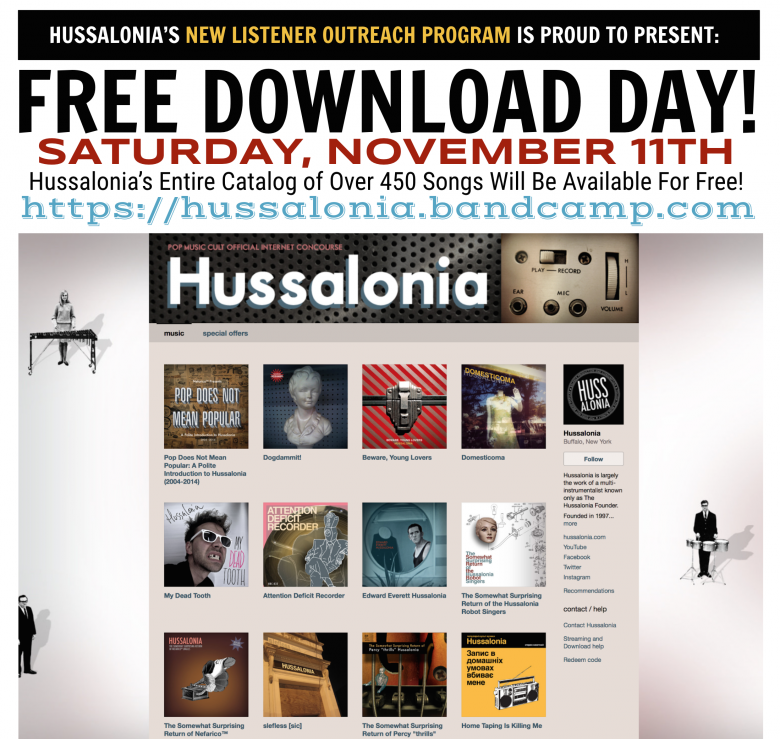 And should you miss this one-day event, Hussalonia's music can be found on nearly all the streaming music services and regular download prices on its Bandcamp page are reasonable ($3 for EPs and $5 for albums). Okay, full disclosure... I know The Hussalonia Founder... and I know him well. All right, all right, you've got me — I am The Hussalonia Founder. But all of the above is true, and I'm hoping for new listeners, hopefully some from the beautiful (and often tragically flawed) hometown that inspired and informed so much of my work. I love you, Buffalo. I hope you love me, too.